YSRCP party chief Y.S. Jaganmohan Reddy concluded 14-month-long 'padyatra' at Ichapuram, Srikakulam dt. After covering 3,648 km, Jagan cocluded his padayatra, which is claimed to be the longest by a politician in India. Jaganunveiled a pylon to mark the event and addressed a massive public meeting. He started the last day from Kojjiria village walking along with top party leaders including MPs and MLAs. Thousands of Jagan supporters joined him for the last day. 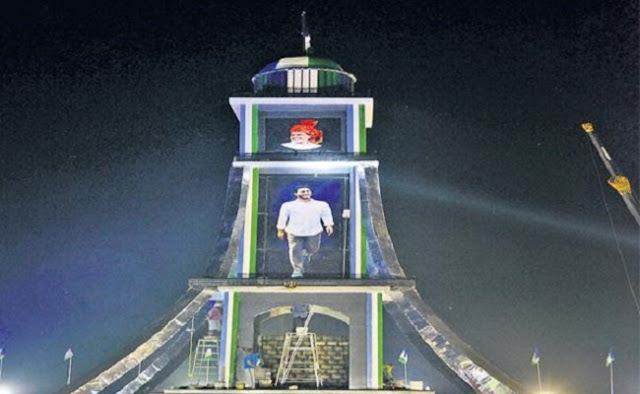 Party leaders have claimed that Jagan reached out to two crore people during the 'padyatra', which covered over 134 out of 175 Assembly constituencies. He has started the 'padyatra' on November 6, 2017, from his home town Idupulapya in Kadapa district. Looking to overthrown the Telugu Desam Party (TDP) led by Chief Minister N. Chandrababu Naidu, Jagan hopes to repeat the feat of his father and former Andhra Pradesh Chief Minister Y. S. Rajasekhara Reddy, who undertook a similar 'padyatra' and came to power in the erstwhile Andhra Pradesh. YSR had covered 1,450 km under his foot-march, which brought him to power.